Played through the medic and the Dane yesterday. Absolutely amazing pedals both of them. Hod do they compare with each other?? I bought one of the first batch of "The Dane" from Andertons, and find it excellent for the way I like to sound. As a former Medic, the "Team Medic" is tempting. They are very different pedals really. It's like comparing apples and oranges. So its happened, all the pedals have now lost some heft...... they sound just the same, however they take up less space on your pedalboard. hope you all like them. Clever video, I didn't notice I was looking at the smaller ones. This is going to trigger my OCD! How am I meant to handle any future ThorpyFX purchases being a different size? They look fantastic Adrian, hope you get lots of orders! Agreed - pedalboard space is always at a premium! But not enough for finicky mini pedals, which I can't stand! I'll add my voice to that....the pedals look fantastic in shiny silver, but it does mean the text is unreadable onstage. The pedal designs are fixed now as I’ve just invested a literal f***ton of time and money redesigning them. Like most of my pedals I tend to set and leave/forget about. I switch guitars, so sometimes I need to tweak the settings. It would be a lot easier if they were easily readable. Not the end of the world, but would be nice if they were readable. Also it'll make the big footprint versions "original size"
As ever that's what white chinagraph pencils are for surely??? Love the new design Thorpy. These look even better than before, and they already looked amazing. If anyone has seen TPS this week the Warthog is quite heavily featured as Mick has been using it for some Cream tribute thing. Mysterious world indeed ... I keep bumping into Mr Thorpe at guitar shows. Strange, that. At each of the last two I was bamboozled in a very good way. Really pleased with the Team Medic, Peacekeeper & The Fat General. , or should that be ? So much so, I've just sold my Keeley Compressor, JHS booster, and the Seymour Duncan 805 OD (along with a delay). And it wasn't just to make way on the pedal board, or to replenish my dwindling GAS fund, but for the tone. I have no regrets. Adrian - many thanks for the great pedals. 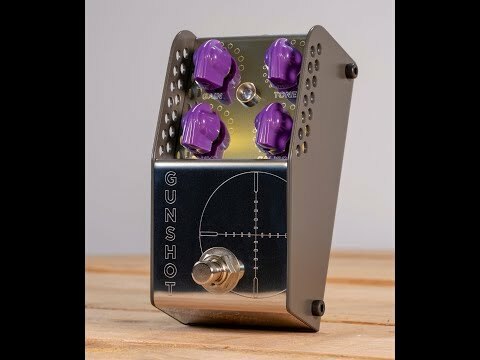 @ThorpyFX Are we allowed to know more about the new Mystery Chorus/vibe pedal yet? Saw a little teaser on Facebook and it sounded great. 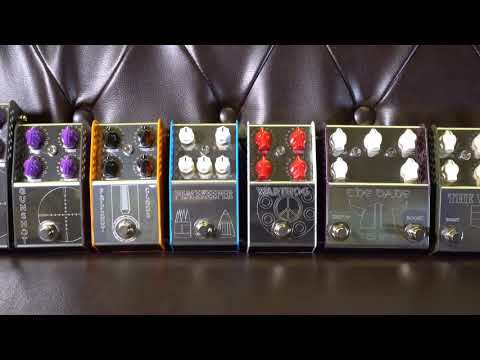 @fandango in your opinion what thorpy pedal is closest to the SD 805, peacekeeper or medic? Im interested in getting a flexible ts style drive for boosting my marshall. The team medic isn’t an overdrive. It’s more of a boost with the ability to tweak the EQ. The peacekeeper is far more transparent than the 805. It depends what you want from an OD. Thanks for that, sounds like neither of them have a tubescreamer feel to them. If you are after the tubescreamer thing then the peacekeeper can cop it by just adjusting the eq. Mids at 1-2oclock, bass at 2oclock, treble at 10-11 o'clock. it then gets you into that thick mid heavy sound that tubescreamers are renowned for. Thanks Thorpy. Out of interest what sort of frequency does the mids on the peacekeeper target, is it around 700hz?